The Rick Hinderer Investigator Steel Pen is the kind of tough, state-of-the-art compact tactical pen you expect from this legendary designer. 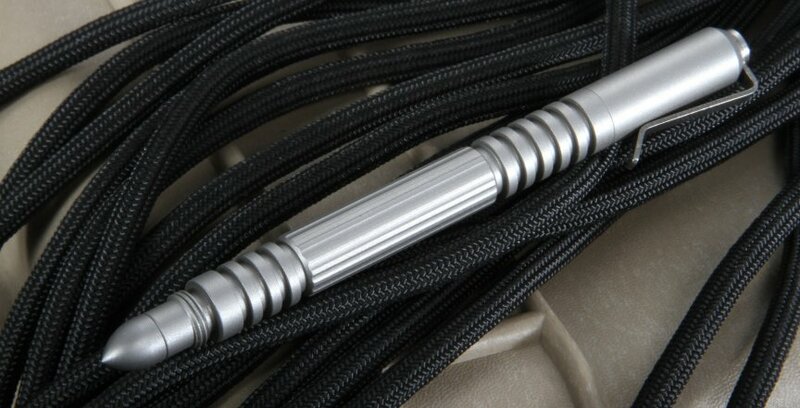 This high-end, CNC and CAD/CAM-designed product has many of the features of the Extreme Duty and Kubaton models in a smaller, lighter size for when prudence and discretion are needed. The basic concept is the same: Build a rugged pen that is good for writing and for getting you out of dangerous situations. 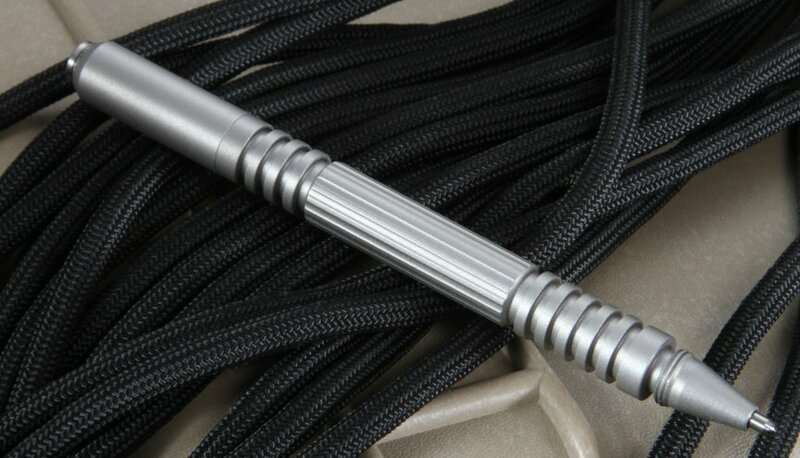 This American-made CQB stainless steel pen is ideal for anyone who needs to ward off attackers. Enjoy the pen's ergonomic feel as you revel in its inherent protection. 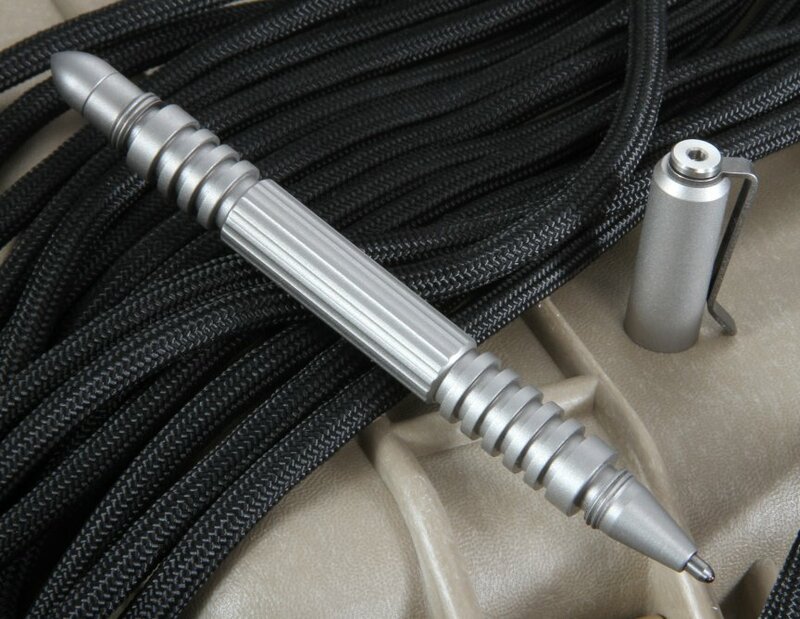 This stainless steel pen is equal parts smooth writing instrument and close-quarters tactical device. Take down meeting notes or make reminders in black bold ink from a pressurized Fisher Space Pen cartridge. Full size refills (pn# SPR4B) are available for replacements. The coarse threads throughout the pen provide additional ruggedness both for if it gets dropped on a battlefield or deployed as a tactical device for hard strikes. It is machined to withstand blunt force easily and ergonomically designed to provide solid finger grip as well as functionality. The deep vertical and horizontal traction grooves are perfectly spaced for a secure hold. Everyday carry is easy when you have a practical and lightweight yet strong compact device. Each design features a stainless steel bullet tip and a cap that can be threaded on the back to stay in place when writing. The Rick Hinderer steel EDC pen is 4.25 inches long, 0.375 inches wide and weighs 1.8 ounces with the fierce ruggedness you need in close-quarter altercations. The stainless steel body is heavier than other Investigator pen models, but the trade-off is even better durability and force when you need it. A bead blasted finish adds longevity and a sweet look that would be right at home in an office. If you prefer a different look or feel, you can get these tactical pens in copper, brass, titanium and hard anodized aluminum. The threaded bullet tip is modular and removable. Replacing it with a new end attachment can give users additional options for striking or compliance to subdue threats. Hinderer Knives & Pens knows that nerves of steel are need in close quarters, and with their stainless steel tactical pen, you'll have the writing instrument to match. With fast shipping and same business day order fulfillment, you are assured a quick product delivery of your Hinderer everyday carry writing pen. We are an authorized dealer and sell Hinderer products with pride at the best possible price. With a 100 percent satisfaction guarantee, you can order our curated merchandise with confidence. Our business model is as rugged and reliable as the merchandise we offer and we are here to serve those who expect the best in their tools. This pen is so nice. It is small but heavy and a great gift to anyone in law enforcement. I highly recommend doing business with knifeart. They called to confirm my order and shipped it promptly. Will order again from them for gifts. Really small, you can bring it everywhere you go, fit well on my hand. Longer than a Fisher Space Pen but the same base. Good Product well finished.